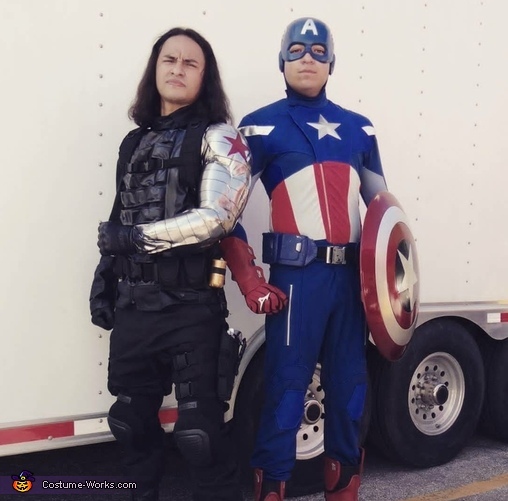 My friend Miguel is wearing his captain America suit from the avengers movie concept and I'm wearing my winter soldier costume from the second captain America movie. I took a pleather jacket and altered it by adding faux leather fabric to the chest to resemble the straps. For the buttons on those straps i used the eyes and painted them black. And the rest of the real buttons I painted black as well because they were bronze. I used velcro on to hold the tips of each strap but the major boarder was held using contact cement. I assembled the h harness and utility belt by purchasing each piece separately but the fake m40 grenades I made from a push candy that I covered in gold tape. The arm was made by putting eva foam on a compression sleeve and covering it in a metallic stretch fabric. The foam was carved to resemble muscles and metal separations and the star was painted on and the so were the metal (horizontal) separations. My friend Miguel got the pattern for his costume and sewed it together and the the gauntlets he took a child's shin guard and altered/painted it. And the mask he purchased but had to paint it to match the costume. He purchased the shield as well and eventually modified it with a magnet so he can put it on his back. The items used for my costume were: button eyes, eva foam, black acrylic paint, Velcro, contact cement, h harness, utility belt, pouches, push candy top, gold tape, 4 way stretch metallic fabric, compression sleeve, and faux leather. I'm pretty sure for his he used a sewing machine, costume patern (fabric), child's shin guards, red paint, blue paint, and adhesives.